The field of nanotechnology has emerged just a decade ago, scientists and pundits were questioning if nanotechnology would ever lead to the development of “real” products with “real” value to consumers. Was nanotechnology just another scientist’s dream that would not provide any practical value to society? Today, not only one ecan buy tennis rackets, bicycles, clothes, and band-aids that incorporate nanomaterials, but it is clear that such products provide greater value to the general public than their respective conventional products. Nanotechnology is no longer just a marketing ploy or a fancy advertisement scheme used by Apple. Gone also are the days of naysayers wondering how nanotechnology is different than the fundamental sciences of chemistry, physics, and biology. What continues to separate nanotechnology from the study of fundamental atomic and molecular interactions that a traditional researcher in those fields may accomplish is an emphasis on new properties of materials gained when controlling structures at the nanoscale - the atomic and molecular level. It is this continual emphasis on the control of structures at the nanometer level that has led to significantly changed properties and products that are advancing numerous fields. This is what separates nanotechnology from other traditional science fields (such as chemistry, physics, and biology). What also continues to provide a bright future for nanotechnology is the selection of difficult contemporary problems that only nanotechnology (it appears) is providing solutions for. This book will highlight some of these persistent contemporary problems in which nanotechnology is finding solutions, such as building novel sensors, alternative energy sources, and improved semiconductors. This book eloquently defines current problems we have with limited sources of carbon-based energy and provides nanotechnology solutions to develop novel solar cells, among other solutions. It also provides solutions unimaginable without nanomaterials to build more precise sensors to detect levels of contaminants previously not possible. New routes of nanoparticle synthesis are also covered in this book to ensure the safe fabrication of high purity, inexpensive nanomaterials – issues critical for the continued commercial success of nanotechnology. Issues of toxicity are also discussed providing valuable insights into how we should choose nanoparticles with low toxicity for particular energy, sensor, or semi-conductor applications. In closing, though, as we advance into the next generation of nanotechnology research we should not forget the past. It has been our emphasis of nanoscale events which has led us to where we are today. For example, the theory of atomic matter was suggested as early as 370 BC by the Greek philosopher Democratis; this could certainly be our first indication of the desire to understand nanoscale events to create materials with tailorable properties. Since then many scientists have followed this train of thought, and, of course, in 1959 Richard Feynman predicted the possibility of maneuvering matter atom by atom. Nano represent very small thing which has diverse applications and high potency that guiding to industrial and technological development. Materials of nano size show remarkable physical and chemical properties due to several factors including the rise in surface area compared to volume which takes place as particles get smaller. Nanotechnology finds its applications in many areas such as novel foodstuffs, medical equipments, chemical coatings, human health testing kits, security system’s sensor, water purification items for manned space craft, displays for hand-held computer games, and cinema screens. Nanotechnology is likely to impart an impact on almost every industry. Recently nanotechnology has become known as the science of every tiny thing, more particularly, 'nano'. Nanotechnology is a catch-all expression for resources and tools that function at the nanoscale. Nanotechnology is a diverse science that has spread its applications in fields such as colloidal science, device physics and supra molecular chemistry. Being a subject of key interest, it was thought out to present recent development in nanotechnology in the form of a book to the scientific community. There are six chapters in this book. In the first chapter, the recent development of nanotechnology in many applications such as energy/power, medicine/healthcare, water purification, biotechnology, electronics, sporting goods, environmental issues, defense/security, and textile/fabrics is summarized. Chapter two reviews the latest developments in the area of nanocomposites with reference to nanoclays, nanofibers and nanotubes. The classification, characterization and applications of various types of nanocomposites have been discussed in aerospace industry. It also highlighted the applications of nanocomposites in relaunch vehicles, space ladders, ablatives, internal motor casing and nano modified carbon/carbon composites. In third chapter, use and potential applications of nano materials, organic semiconductor complexes and composites sensors, organic field effect transistors, thin-film field effect transistors, temperature sensitive field-effect transistor, solar cells, and light-emitting diodes have been summarized. Fourth chapter describe nanotechnology, nanomaterials, nanocomposites, their importance, synthesis and characterization of nanocomposites. 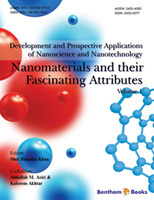 Fifth chapter describe synthesis of nanoparticles of various compositions, their exciting properties and size, and morphologies for a wide range of applications. Chapter six deals with DFT study of nanoparticles using run type of Frequencies in ADF-Molecule interface. We deem that this book will convey the savor of the nanotechnology properly and illustrate that study on nanomaterials is emerging to be of key interest. We intently anticipate that this book will be beneficial for students, teachers and practitioners.